Sushi made from Spam? Oh, yeah, why not? Sushi, along with host of other unique Spam recipes are being showcased at state fairs across the country. 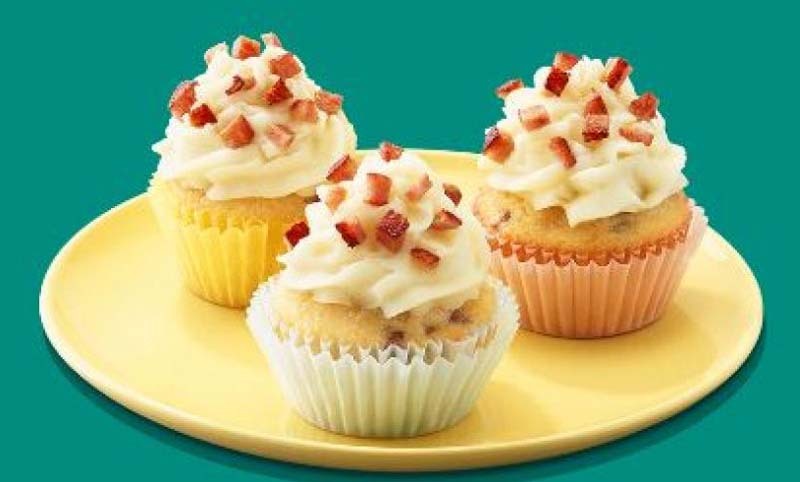 From sushi to cupcakes, it's official, Spam, everyone's favorite canned pork product, is here to stay. In fact, Spam is thriving, despite a recent recall. Eight billion cans have been sold worldwide, where it can be purchased in at least 41 countries. Guam ranks as its finest consumer, with 16 cans purchased on average, per resident. In the United States, Hawaii ranks as the No. 1 Spam eating state. The cultural relevance of Spam dates back to World War II when soldiers relied on the canned pork product for its eat-out-of-the-can convenience. [post_ads]Spam's versatility is unmatched, especially around state fair season, when Spam chefs throughout the country showcase their different ways Spam can be incorporated into a recipe. It's not just for dinner, besides sushi and the traditional Spam burger, candy bars and cupcakes also can be created with Spam. Despite its reputation as not being particulary a first-choice of fitness and health-conscious consumers, it's made from just six ingredients -- pork shoulder and ham, salt, water, sugar, potato starch and sodium nitrate, making it a healthier option, than say, hot dogs or sausage. And if you’re just randomly just happen to be driving through Minnesota, the birthplace of Spam, the Minnesota State Fair (Aug. 23-Sept. 3) will exclusively launch its Spam sushi for fairgoers next week. 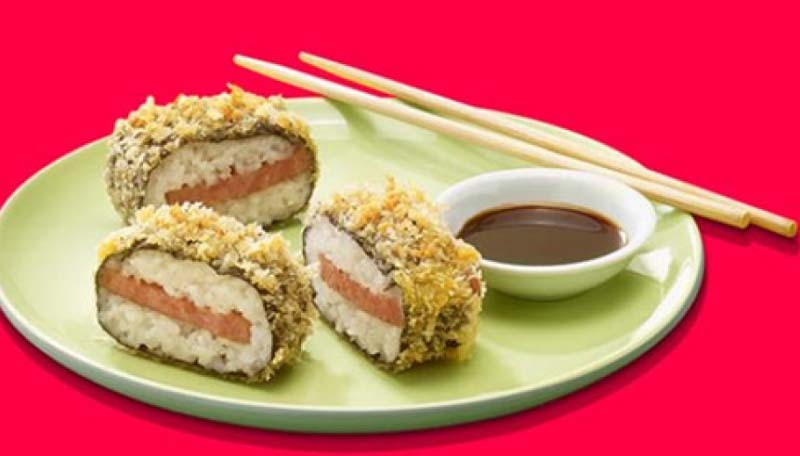 If you're not so fortunate, you can still create your own sushi, along Spammy cupcakes and everyone's favorite -- chocolate Spam-dy bars at home with a multitude of Spam recipes. 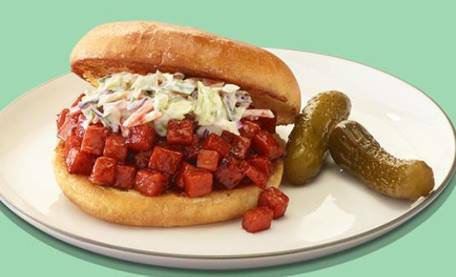 "One of the great things about the Spam brand is the versatility that lends itself the ability to be paired in many different ways, which appeals to consumers across varied taste preferences," said Brian Lillis, Spam brand manager. "For a number of years now, chefs at restaurants across the country have been incorporating the product into a variety of dishes. We are never surprised to see the creative ways culinary professionals and home cooks alike are using Spam products." Here are three simple and Spamtastic recipes you can make anywhere, anytime. 1.In large skillet, cook Spam Classic until lightly browned and crisp. Drizzle cooked Spam Classic with grill sauce or cooking sauce. 2. Place rice into nori sheet with plastic wrap below. Press rice down firmly. 3.Sprinkle with seasoned furikake and toasted sesame seeds, if desired. 4. Place Spam Classic on rice in press down firmly. 5. On work surface roll (like a sushi pro) and cut nori to desired width. Serve immediately and garnish with wasabi if you’re wild! 1. Preheat oven to 350° F. Line muffin pan with 12 cupcake liners. 2. In large skillet, brown Spamuntil golden. Drain on paper towel. 3. In large bowl, combine flour, baking powder, sugar and salt. Add Spam, reserving Â¼ cup; stir until combined. 4. In medium bowl, whisk melted butter, milk, eggs and vanilla together. Add to flour mixture. Stir until combined. Do not over-mix. 5. Spoon batter into each cupcake liner. Bake 20 to 25 minutes or until cooked. Let stand in pan 5 minutes before removing to wire rack to cool. 2. Cut Spam Classic into 16 bar-shaped slices. Place on parchment-lined baking sheet. 3.Mix brown sugar, maple syrup and 1 teaspoon cinnamon in a small bowl. Brush evenly on all 16 slices of SPAM® Classic. 4.Bake 15 minutes; remove from oven and turn slices over. Brush with additional glaze. Bake another 15 minutes. Move to parchment-lined cooling rack. 5.While Spam slices are cooling, mix chopped pecans, sea salt, and 1/2 teaspoon cinnamon for topping; set aside. 6.In double boiler, melt both chocolates, stirring until smooth. 7.Using tongs, dip each piece of candied Spam Classic in melted chocolate until coated on all sides. 8.Place on wax paper-lined baking sheet and sprinkle with pecan mixture. Chill in refrigerator 10 minutes or until set. Makes 16 bars. Store in refrigerator. Lifestyle - U.S. Daily News: Sushi made from Spam? Oh, yeah, why not?